Notice that our map still has President Obama at 277 electoral votes, or seven more than he needs to win the election. 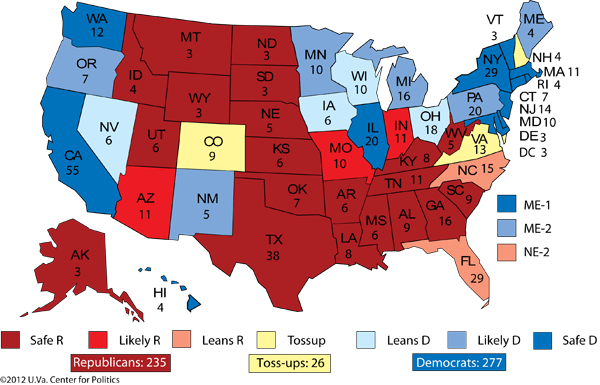 Romney, now at 235 after our rating change in Florida, needs to pick off the remaining toss-ups — Colorado, New Hampshire and Virginia — to get to 261 electoral votes (of those, the Granite State is probably the hardest lift). Then Romney would need either Ohio or Wisconsin, or both Iowa and Nevada. 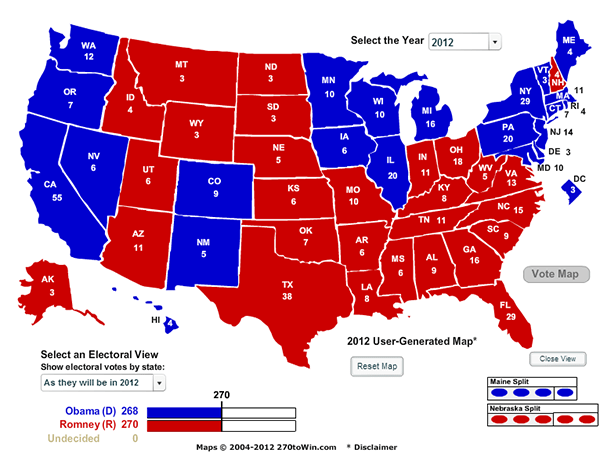 Compared with the earlier map, Romney doesn’t need a giant transformation — and this should cheer the GOP. …with some analysis of my own. (1) Nevada is gone. Write it off for the Dems. (2) Virginia, North Carolina, and Florida are firmly in the GOP camp. Sorry to break it to my Democratic friends, but we all know that it’s just gonna shake down that way. New Electoral College math at this point? Obama 243 Romney 248. (3) Wisconsin and Iowa are probably going to lean Democratic. This brings Obama to 259. (4) Ohio goes Romney. The momentum is in full swing three weeks before the election, and Obama is talking about Big Bird? Got it. (6) New Hampshire. That’s your canary in the coal mine. If New Hampshire decides to live free rather than die and votes Romney in a convincing fashion, the West Coasters will take the cue and Colorado will swing right. If New Hampshire goes Democratic or “the votes still have to be counted” and recounted and recounted… you create just the sort of environment where Democratic voting is imperative in a swing state like Colorado — just in time for the evening news. If Romney wins New Hampshire, the game is over and Mitt Romney is your next president. If the national conservative resurgence is so strong as to carry New Hampshire, I predict Romney will more than likely carry Ohio and Colorado. If Romney wins New Hampshire and carries only Ohio, it doesn’t matter how Colorado sorts out — Romney wins with 270. Yet if Romney loses Ohio… the game is over entirely. …but if it’s going to be anything but a nail biter, New Hampshire has to vote Republican. If they don’t… then the rest of the evening will be very long indeed. So what’s the catch for the Democrats? Strategists on the left love to talk about paths to victory. The GOP has one single path. It runs through Ohio. It still remains up to the Dems to provide any path to victory around the GOP monolith. Those options for mapmakers such as Professor Sabato are narrowing quickly — and have narrowed dramatically — over these next few weeks. Should Paul Ryan provide the KO punch tonight to Joe Biden, Obama may very well feel the relief of knowing he will not have to shoulder a second term… and perhaps come out swinging in the second and third POTUS debates. Should Obama do that, perhaps this map changes. At the moment, when polls are showing states such as WI, MI, and even PA in play… an honest Democratic operative can’t help but feel uneasy right now.